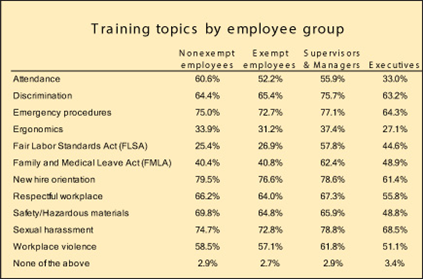 Yesterday’s Advisor provided some of the latest research on training and development from BLR’s recent survey; today, the rest of the results from our study, including detailed responses regarding employee development, popular training topics, and the top products and services in the training arena. A total of 976 respondents provided their opinions in the Training and Development Survey, conducted in April 2015. Formal mentoring programs are available for employees at 29.6% of survey participants’ organizations who answered this question in our survey, and they are available for supervisors at 22.5%. Manager-level employees are included in formal mentoring programs at 22%. Formal onboarding programs for new employees are in place at 76%, and a formal training program for high potential employees is available at 35%. The second HR Playbook from BLR® is here! Learn retention best practices for 2015 and beyond in the new guide, Employee Retention and Satisfaction: How to Attract, Retain, and Engage the Best Talent at Your Organization. Incoming employees with no college education require more nontechnical training than their counterparts of prior years for 27.2%. This employee group requires the same amount of training for 49.1% and less training for 3.3%. Also, they require more tech training for 26.4%, the same amount of training for 53.6%, and less training than in the past for 5.5%. College-educated workers require more nontech training for 21%, the same level of training for 58.4%, and less training for 8.8%. College-educated workers require more tech training for 17%, the same amount of training for 57.2%, and less training for 14.8%. The training topic most needed for the organizations represented by our survey participants is leadership/supervisory skills (19.2%), followed by engagement/motivation (12.3%). Training in communication skills comes in third at 11.6%, with performance management training next at 10.3%, and employee conduct/workplace respect at 10.1%. More time for training is the number one need for 19.9% and cost-effective training is the number one need for 16.6%. A training needs analysis is at the top of the list for 11.7%, and training measurements/metrics is the number one training need for 11.1%. The number one complaint regarding training is a limited budget for 15.8%, and not having enough time for training heads the complaint list for 13.3%. 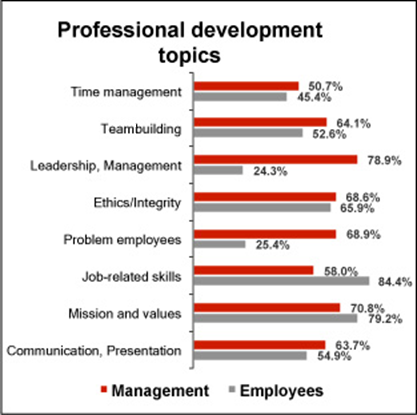 Having no formal training program is the biggest complaint for 10.7%, and lack of management support is the number one issue for 10.4%. 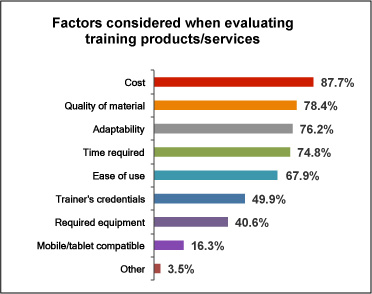 Cost of training products/services is a consideration for 87.7% of survey participants, and the quality of the training materials is a decision factor for 78.4%. Adaptability to their needs is important for 76.2%, and the amount of time required for training is a factor for 74.8%. Ease of use is a consideration for 67.9%. Trainer credentials is a factor for 49.9%, while the ability to deploy training materials on mobiles/tablets is a consideration for 16.3%, and the kind of equipment required is a consideration for 40.6%. The most recommended source/vendor for training is the Society for Human Resource Management (SHRM) at 63.7%. Coming in second and third are BLR® (51.7%) and HR.BLR.com® (50.6%). Fourth and fifth are OSHA (49.7%) and the Human Resources Certification Institute (42.9%). 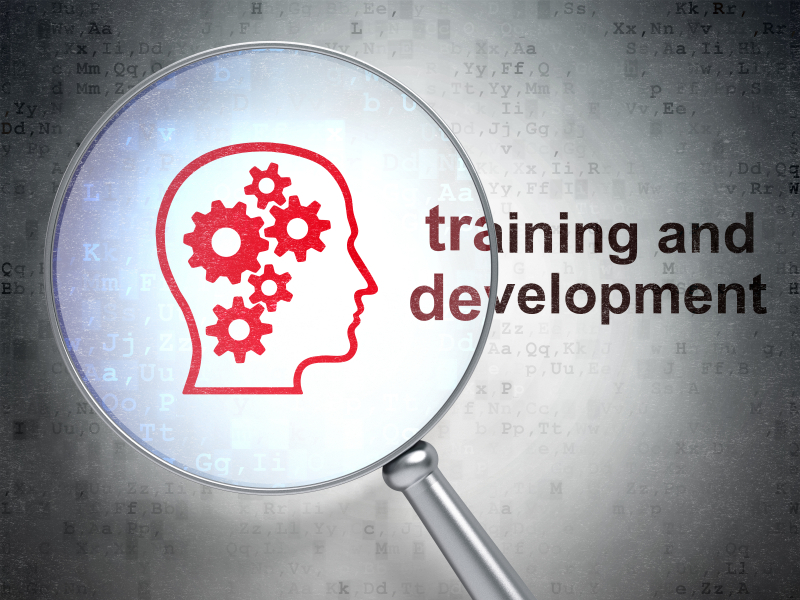 Training and development opportunities can have a dramatic effect on your organization’s retention and turnover—issues that are on every HR manager’s front burner. Turnover is your organization’s most debilitating disease. Retention—of the people you want to retain—is the backbone of your organization’s success. Gain an advantage with the new guide, Employee Retention and Satisfaction: How to Attract, Retain, and Engage the Best Talent at Your Organization. This second HR Playbook from BLR explores the many facets of retention and engagement, giving practical guidance, new approaches, and proven methods for achieving excellence in these challenging times. Once you have top talent, be sure to retain them! It’s all in the new HR Playbook, Employee Retention and Satisfaction: How to Attract, Retain, and Engage the Best Talent at Your Organization. Find out more or order here! When do you start thinking about retention? On day one. Start strategizing today with Employee Retention and Satisfaction: How to Attract, Retain, and Engage the Best Talent at Your Organization. Click here to learn more or order your copy today!